The SR570 is a low-noise current preamplifier capable of current gains as large as 1 pA/V. 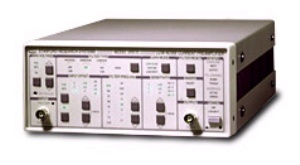 High gain and bandwidth, low noise, and many convenient features make the SR570 ideal for a variety of photonic, low temperature and other measurements. The SR570 has sensitivity settings from 1 pA/V to 1 mA/V that can be selected in a 1-2-5 sequence. A vernier gain adjustment is also provided that lets you select any sensitivity in between. Gain can be allocated to various stages of the amplifier to optimize the instruments performance. The low noise mode places gain in the front end of the amplifier for the best noise performance. The high bandwidth mode allocates gain to the later stages of the amplifier to improve the frequency response of the front end. In the low drift mode, the input amplifier is replaced with a very low input-current op amp, reducing the instrument’s DC drift by up to a factor 1000. The SR570 contains two first-order RC filters whose cutoff frequency and type can be configured from the front panel. Together, the filters can be configured as a 6 or 12 dB/oct rolloff low-pass or high-pass filter, or as a 6 dB/oct rolloff band-pass filter. Cutoff frequencies are adjustable from 0.03 Hz to 1 MHz in a 1-3-10 sequence. An input offset-current adjustment is provided to suppress any undesired DC background currents. Offset currents can be specified from ±1 pA to ±1 mA in roughly 0.1 % increments. The SR570 also has an adjustable input DC bias voltage (±5 V) that allows you to directly sink current into a virtual null (analog ground) or a selected DC bias.